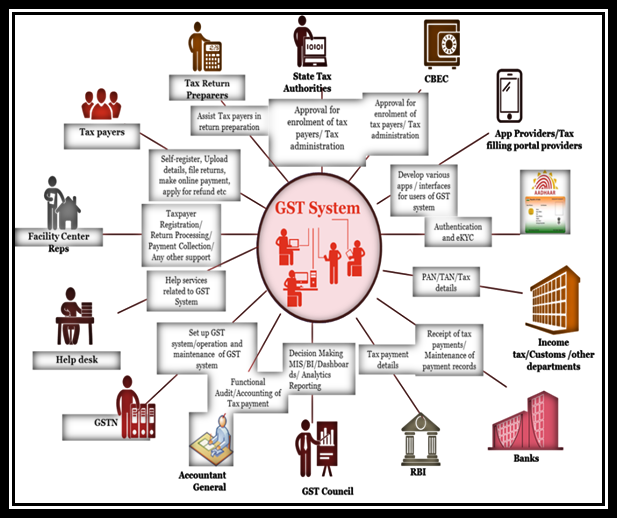 In the third article of the series on GST, we will tell you about GSTN. The Goods and Services Tax Network (GSTN) is a not-for-profit, non-government company promoted jointly by the Central and State Governments, which will provide shared IT infrastructure and services to both central and state governments including tax payers and other stakeholders. The front-end services of Registration, Returns, Payments, etc. to all taxpayers will be provided by GSTN. It will be the interface between the government and the taxpayers. Carry out research and study best practices. In the GST regime, the core services required by taxpayers, such as applying for registration, uploading of invoices, filing of return, making tax payments shall be hosted on GSTN. However, all the statutory functions (such as approval of registration, assessment of return, conducting investigation and audit etc.) shall be conducted by the tax authorities of States and Central governments. Thus, the GST Portal services (frontend) shall be provided by GSTN. As regards the backend services (the modules for processing the applications/returns etc.) are being developed independently by 9 States (Model 1) and Central Government themselves. However, 27 states (termed as Model-2 states) have asked GSTN to also develop their backend modules. For the tax payers’ convenience, GSTN will provide the taxpayer options of using third party applications, through GST Suvidha Providers (GSP), which can provide different kind of interfaces on desktop/mobile for them to be GST compliant. GSTN has empanelled 34 GSPs so far for benefit of trade and industry. The list of the empanelled GSPs can be seen here. The GST portal (www.gst.gov.in ) will be one single common portal for all GST related services such as Tax payer registration (new, surrender, cancelation, amendment etc. ), Invoice upload, auto-drafting of Purchase details of buyer, GST Returns filing on stipulated dates for each type of return, Tax payment by creation of Challan and integration with agency Banks, Electronic Credit Ledger, Cash Ledger and Liability Register MIS reporting for tax payers, tax officials and other stakeholders and Business Intelligence /Analytics for Tax officials. GSTN will be accessible over Internet (by taxpayers and their CAs/Tax Advocates etc.) and Intranet by Tax Officials etc. A common GST system will provide linkage to all State/UT Commercial Tax departments, Central Tax authorities, Taxpayers, Banks and other stakeholders. The GST system will include all stakeholders – taxpayers, tax professionals, tax officials, Banks and accounting authorities. The diagram given below depicts the whole GST eco-system.